The out-half starts for Munster against Ulster tomorrow. 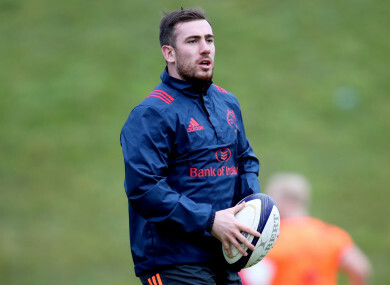 IT HASN’T EXACTLY been a fairytale homecoming — or at least the grand return a try-scoring cameo on his first appearance suggested — but JJ Hanrahan is happy to bide his time after a slow start to life back at Munster. The 25-year-old returned home from Northampton Saints during the summer after two injury-plagued seasons in the Aviva Premiership only for some of the same problems to deny him the game time he so desperately craves at this juncture of his career. The shoulder injury which curtailed his stay at Franklin’s Gardens then delayed his return to action for Munster as the out-half missed the first five games of this season. Hanrahan’s second debut for the southern province came off the bench against Cardiff Blues at the end of September as he marked his return in spectacular fashion with a quick-fire brace of tries. But a few glimpses of his undoubted ability aside, Munster fans have yet to really see how much Hanrahan has developed as a player since making the bold step to leave Thomond Park a few seasons ago. Tyler Bleyendaal’s early-season form and the recent resurgence of Ian Keatley has meant opportunities have been limited for the Kerry native and overall, including that cameo against the Blues, he has featured just eight times this season, three of which have been starts. “I wouldn’t say frustrating,” he insists. Hanrahan will hope to show how hard he’s worked when he starts for Munster in tomorrow’s New Year’s Day inter-pro against Ulster at Kingspan Stadium in what will be his first start under Johann van Graan. “I suppose every time a new coach comes in, it is more stuff to learn, it’s a different voice, a different point of view on rugby and you can just pick up little nuggets all along the way. It all helps you get better. “I am happy enough. I think I can improve, there is plenty still to improve on. Rugby is an on-going battle every day. Some days are good, some are not, especially in the number 10 role. Looking back on his time in England, during which he made 31 appearances for the Saints, Hanrahan says it was a good move for him in terms of developing his game management, even if he didn’t get as many minutes as he would have liked. “I suppose it depends on what you deem success as,” he continues. “If you deem it as on the rugby pitch, playing every week, probably not so much because my second year I was only available for 10 games through injury, so you would say no in that aspect, but in terms of an overall holistic approach, from a growth mindset, you would say yeah. “I suppose the main thing I learned is the game management side of things. A lot of the time when you are over in the Premiership a lot of it can come down to penalties and things like that, sometimes it can be more of a not playing in your own half, put the ball in their half. It is more of a control game. I learned that from being in England and being in the Premiership. And now that he’s put his recent injury problems to one side, Hanrahan is relishing the opportunity to start in the pivot position at Kingspan Stadium as both Ulster and Munster look to bounce back from disappointing results over the Christmas period. For Hanrahan, this is an opening he needs to make the most of. “Getting the chance against Ulster is a big opportunity,” he admits. “It is not easy up there. Kingspan can be a hostile enough place as we all know, but I think it is a challenge you have to relish if you are going up there. Email “Hanrahan determined to seize chance at 10 after slow start to Munster homecoming ”. Feedback on “Hanrahan determined to seize chance at 10 after slow start to Munster homecoming ”.